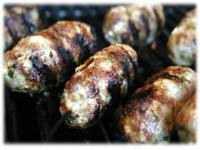 If your familiar with Kofta you'll know it's a Middle Eastern specialty typically made of lamb. 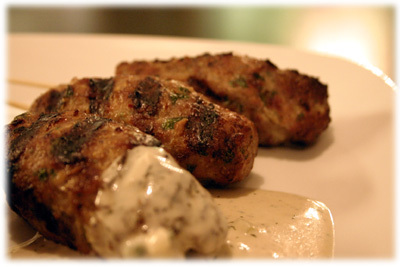 If your not overly fond of lamb then use the chicken in this recipe to make the kebabs. 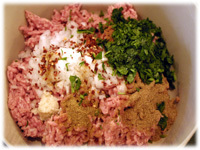 I've also taken some of the "old" and blended them with "new" ingredients you wouldn't normally find in Kofta. And for an added bonus I've also developed a simple creamy Garlic Cucumber sauce that is absolutely fantastic with this recipe for dipping but also goes great with many other summer BBQ dishes as well. 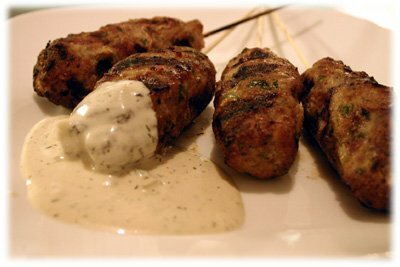 In a large bowl combine all of the chicken kofta kebab recipe ingredients and mix well. Place 1/3 cup of the mixture in the palm of your hand and roll between your two hands to make a cylinder or tube shape about 4" long and about 1" in diameter. 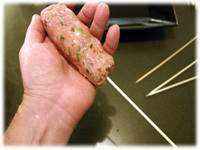 Insert one of the pre-soaked skewers up the center of the chicken kofta meat just until it begins to poke out the other end. 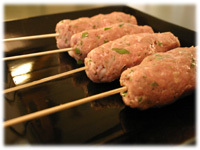 Tip: You may also want to wrap the skewers in foil to help prevent burning. Clean and oil the grates and preheat the grill to 525F - 550F. 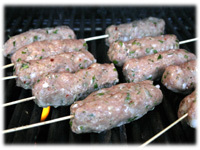 When the grill reaches this temperature range place the kofta kebabs on the grill and close the lid. Every 5 minutes rotate each kebab so all sides cook. After 10 - 12 minutes they'll be cooked (internal temperature 165F) and can be removed from the grill. Serve with this the creamy Garlic Cucumber sauce and some pita, naan bread, tortilla shells or buns. Also consider chopped tomato, onion, cucumber or other toppings.